Native Chinese tree introduced into western cultivation in 1892. Small ovate to elliptical leaves and white blooms, followed by red fruits. Froms a slender tree with frine erect branching. Good shade or specimen tree. Hardy to -50F (-45C); height: 60ft. Small tree with a rough open growth habit. Large green leaves and large flower heads followed by edible red fruits. Native to North America. Good as a wildlife planting or specimen tree, it prefers a moist, well drained soil. Hardy to -50F (-45C); height: 30ft. Native European variety where it grows on limestone rock outcrops or chalky ground. It has simple (undivided) elliptical leaves, prominately veined, and a wide spreading head. White spring blooms are followed by orange-red edible fruits. Hardy to -50F (-45C); height: 30ft. 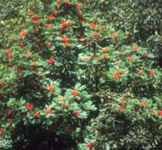 The Rowan is a very decorative species, with large clusters of red berries and brilliant orange-red foliage in the fall. Wide spreading crown and sturdy single trunk. Blooms are white and appear in clusters in the spring. Excellent choice for shade or ornament. Hardy to -50F (-45C); height: 30ft. Medium sized tree with a large spreading crown. Leave are elliptical and deep green. Blooms are white, followed by pinkish white berries in the fall. Makes an excellent shade or specimen tree. Hardy to -50F (-45C); height: 30ft.